Click on the Image for More Photos of the Set! This is a collection of officially licensed Zelda plushies! I am still looking for some, so feel free to swing by my Wish List to check them out! Other Info: While researching these plushies, it appears that there are two versions of each. There is an 'Open Mouth' version and a 'Smile' version of each of the Links. I have only ever seen 'Open Mouth' Tetras, but if we're to base our assumption off of the trends of the Links, I wouldn't be surprised to find a 'Smile' Tetra out there somewhere. 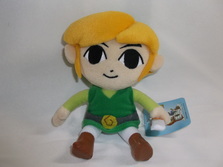 Other Info: The Small 2007 San-ei Link is the oldest of this art-style of plushie. It was released in Japan and is very similar to its predecessors from Global Holdings. Major identifiers for this plush are the darker shaded felt-like fabric, jersey-fabric printed sword (double sided) and shield, felt belt and angular felted buckle, vinyl boots, light blue Phantom Hourglass tag, and a small ribbon tush-tag with lime green Japanese print. Other Info: This set is made up of two identically-styled Link plushies in two different sizes: small and large. Interestingly, even thought they are part of the same set, the larger plush wasn't released until five years after the original release of the smaller plush. This set made by Global Holdings is a North American remake of the 2007 San-ei Link. They are identical, except for size obviously, and in many ways are identical to the San-ei edition. The only differences are their slightly light colors, the tan Phantom Hourglass tags, and the white ribbon tush-tags with English/Spanish/French black print. See the a detailed comparison of the various officially licensed Toon Link plushies here in my blog. Other Info: This set is made up of two identically-styled Link plushies in two different sizes: small and medium. 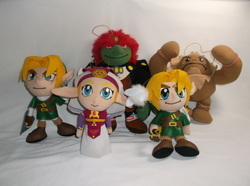 The Links are similar in design to Sen-ei's previous Link plushies from Phantom Hourglass. This set, however, includes a Princess Zelda plush and a Tingle plush. See the a detailed comparison of the various officially licensed Toon Link plushies here in my blog. Other Info: This plush was released as part of World of Nintendo series, along side posable figures. Other Info: This plush was released as part of World of Nintendo series. Although the series number for the 8-Bit plushies is listed as 1-1, these were not commonly seen on the market until much later in the release of the WoN toys.